Ralph Waldo Emerson and his family lived in this house in Concord, Massachusetts. The Emersons in 1879 with their children and grandchildren on the East Doorstep, Emerson House. Standing left to right; Edward Emerson, Edward Forbes, Ellen Emerson, Edith Forbes, Ralph Waldo Emerson, Cameron Forbes, Lidian Emerson, Don Forbes, Ralph Forbes. Seated left to right; Annie Keyes Emerson, Charles Emerson, Edith Emerson Forbes holding Waldo Forbes. Lidian jackson emerson with son edward. courtesy of concord free public library. I am rejoiced in my Reason as well as in my Understanding by finding an earnest and noble mind whose presence quickens in mine all that is good and shames and repels me from my own weaknesses. Can I resist the impulse to beseech you to love me? …I am persuaded that I address one so in love with what I love…that an affection founded on such a basis cannot alter…Say to me therefore anything but no. Lydia married Emerson on September 14, 1835 at her home in Plymouth, MA. Lidian, as her husband called her, was educated, intelligent and active in social causes such as abolition. She was a member of Concord’s Female Anti-Slavery Society and supported women’s suffrage. Also she cared deeply for animals and was sensitive to their humane treatment. ruth haskins emerson. courtesy of concord free public library. Our grandmother lived with us, and a sweet calm place her room always was. There each of us at the age of three came daily at ten o’clock to be taught our letters at Grandma’s knee and learn to read. 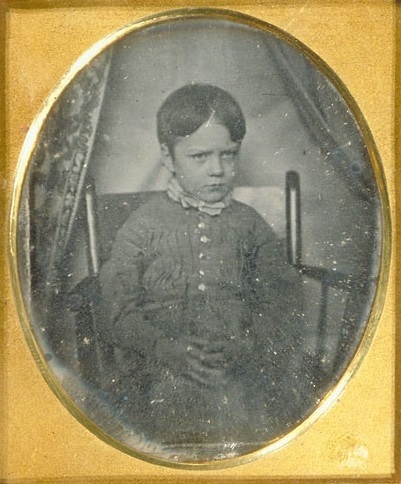 waldo emerson at five years old. Photo courtesy Emerson family papers (MS Am 1280.235 item 706.17) Ralph Waldo Emerson Association deposit, Houghton Library, Harvard University. Waldo was the first child of Lidian and Emerson. He died of scarlet fever at five years of age. Waldo was the apple of his father’s eye. He would spend long hours playing quietly in his father’s study. 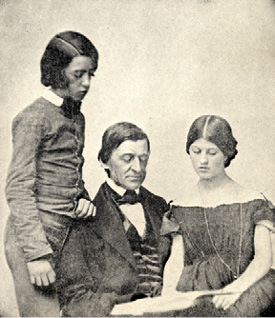 After his death Emerson wrote Threnody (a poem of mourning) to memorialize his son. ellen tucker emerson. courtesy of concord free public library. Named after Emerson’s first wife, Ellen was born as their February Flower. She was a life-long resident of Concord and an active member of the community. 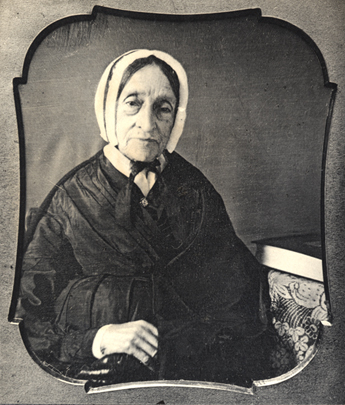 She was the first woman on the school committee and taught Sunday school for forty-seven years. Ellen devoted her life to helping her parents and family, and was her father’s dedicated travel companion and organizer of his papers. She wrote a biography of her mother, The Life of Lidian Jackson Emerson, and also was a prolific letter writer. Her letters, which have been compiled in a two-volume work published in 1982, vividly record life in the Emerson household and the Concord community. Edward waldo emerson, ralph waldo emerson, edith emerson. There are several very agreeable circumstances about that child’s going away, but there is one sad one and that is that she is gone…Yes she was an idle minx, but she has gone and she troubles me. 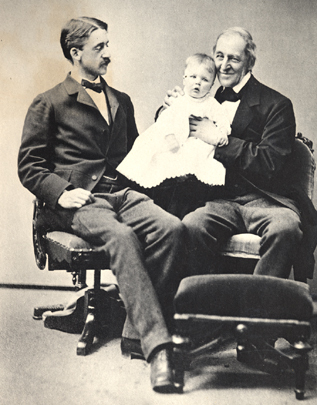 edward waldo emerson, and ralph waldo emerson holding his grandchild charles emerson. courtesy of concord free public library. Edward, a life-long Concordian, was the youngest child in the family. He graduated from Harvard Medical School in 1874 and established his practice in Concord. After his father’s death he left the practice of medicine and spent his time writing, editing his father’s papers and painting. Edward was a founding member of the Concord Antiquarian Society (now the Concord Museum) and an active participant in town affairs. He married Annie Shepard Keyes, a Concord native. They had seven children, six of whom preceded their parents in death. A son Raymond survived his parents.